Things are going pretty smooth in Area 4. The scripted events are becoming a bit more complex and awesome than the original plan, but the extra effort is going to pay off. There's still some balancing to be done to the miniboss, and music production is a bit behind schedule for that particular area. But the place is starting to have its own personality and atmosphere. Area 5, on the other hand, is very likely to receive a complete overhaul (trying to reuse the existing rooms as much as possible), to make room for the new planned features that are exclusive to that location. I wish you have a great celebration, close to your loved ones. One of my wishes for this next year is to be able to play AM2R complete, as a full game. I'll do my best to make it happen. May your personal goals for this year be fulfilled, and most importantly, be safe and be happy. Wish you the same, have a pleasant time with your family! Even if AM2R can't be completed next year I'll be looking forward to each and every update. Doc, you're almost there. You're in the home stretch to completing this magnificent remake. You and everyone that has helped on the team should be very proud of yourselves; this was a huge undertaking, and it's definitely been worth the wait. I look forward to when this remake is done. Good job on everything so far! Hey dude. Your doing a great job. Everyone is counting on you, so don't work too hard and get burned out. What you and your team have done is very impressive. This old gameboy game is becoming a modern masterpiece. We all love you, Thanks for all your energy. Have a great year. We shall be watching. Great work on this project and i also wish and hope for it's fullfillment whenever it get's done! Happy holidays to you, too! My mind is blown! A long time ago I wasn't sure if this project will progress further since there was a long time of inactivity. Yesterday I randomly opened your blog and.. BAM! Activity! And a great demo released a few months ago. The amount of content totally surprised me, it was really awesome. And you did a great job at imitating the structure of the original map. Keep up your great work, you are all awesome. This will be a great project after all when it's finished. Feliz navidad para tí también. Es un placer jugar lo que tú con tu esfuerzo programas y ver lo que hacen los chicos que te ayudan con los sprites o básicamente todo lo gráfico. Ten una feliz navidad y que mejore todo aún más el siguiente año. Can't wait for the next demo! Dude, I'm currently playing the GameBoy version of Metroid II, just to re-acquaint myself with the surroundings and get back into the vibe of the later areas in preparation for the next update you release. I hope everything is well, and that it all runs smoothly for all of our sakes (haha), and that your holiday season is as relaxing and satisfying as mine is. I thank you for everything you've done to the re-make so far, and thank you in advance for the updates to come. It is honestly the best Metroid game I have ever played, hands down. It trumps any Metroid game Nintendo have ever made which is weird seeing as they created the franchise, but hey, created by a fan, for the fans, right? Haha. Anyway, make sure you have fun creating and finishing the product. Do the best you can, and you'll succeed with flying colours. Can't wait for the next update man and merry christmas! I hope that you will release the full game ! It's a great job and I know that it's a hard work. But don't give up ! Take your time, but above all, have fun ! After this is done, will you do Super metroid please? Man, you're the best ! With this post I think you've helped a lot of us (who follow the project) to be happy and hopefull for 2015 ! Great time for Xmas and the new year and thank you for your work ! Have been following the project for years. I'm starting to feel it even freeing itself from Nintendo's way of formating each episode. Am2r learns from specific points in the series, exploiting them ingame as strong mechanics to bring altogether, also with various new stuff, exciting ideas. And thus Return of Samus is such a wonderful work already : here is some challenge ! Keep it up and happy new year to the crew, and y'all around here. very good game just turn it today!!! I've been following this for years! Great job! Excited with the progress so far and am anxious for the final product! May this be the year of Metroid! The same for you! Thanks again for all your work :) I'm so happy about your progress... You're almost there! Getting Excited for new update. Played through demo again just to relieve it. I just 100%-ed the current update of AM2R. I enjoyed it immensely. When this project is finished, it will definitely be awesome! It already is awesome, but it will be even more so after the final release! I've been following this since it began, and I can say that your project is definitely going to be the definitive way to experience the story and atmosphere intended from the original Metroid II. Keep it up! Excellent stuff here! I just discovered your project after stumbling across a video on YouTube. I've been a lon-time Mtroid fan, and after downloading the current demo and playing it myself, I just had to come back here to praise you on the work you've done. I've played through the original Metroid 2 numerous times back in the day, and can say with confidence that you've done a brilliant job transitioning and adapting it to a more cohesive, polished game, while still remaining faithful to the source wherever possible. All the areas felt new and interesting, but were still instantly recognizable. Speaking of polish, I adore all the extra work that has gone into the fine details and atmosphere. Water drops plinking off Samus's helmet, fireflies gathering around the lights on her suit, the idle animations, unique (and well chosen) sound effects for the multitude of actions in-game; it's all brilliantly done. I'm an insufferable purist when it comes to details like that, and you have no idea how pleased the attention you've shown in the project thus far has left me. I also must commend you on the variety of mobility options you gave Samus in comparison to the original game. Ledge grabbing and wall jumping has never felt better, and I appreciate the addition of aim lock (or moonwalking), and the simple fact that you allowed for a slower walking animation before running. Not to mention that, after having to bear the beam stacking feature of the more recent official Metroid games, you've offered the option to toggle and customize things to the player's liking once again. It's the details like that which really push this above and beyond. There are just two very small and trivial details I wanted to bring to your attention. First, I noticed while playing that when Samus is facing right, aiming diagonally downward, and walking (not running), the yellow torso portion of her suit turns orange. Secondly - and this is more a personal preference than anything - Automs ( see: http://metroid.wikia.com/wiki/Autom ) are conspicuously silent when they attack. If I recall, the original Metroid 2 had a sound effect when they spewed out fire, and it would be nice to see (or hear, as the case may be) a sound for them in this remake, as well. Overall, you've done an absolutely amazing job with this so far. I'll be eagerly awaiting new updates! Just tried the demo. Looks fantastic, excellent job. Now to figure out where to go. I wish you a good year anyway ! 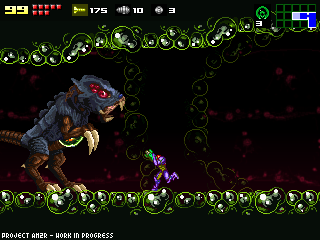 I don't remember Metroid 2 that well, but how far into the game have you remade so far? I've recently been browsing through Metroid II videos, and someone discovered that it was possible to complete the game without spiderball or spacejump.